This report focuses on Surface Transportation (ST), both fixed and route-based, and the growing threats to their information technology (IT) infrastructures. As an industry, ST seeks to optimize the movement of people and goods, while ensuring safety and resiliency and minimizing environmental impact. Cyber threats are a powerful medium for those with the political, social, and economic motivations and wherewithal to disrupt and destroy existing ST systems. The ultimate objective is to develop a new paradigm to define, describe, design, and deploy the most effective protection, at the lowest cost, in the shortest time within the limits of available resources. This paper seeks to initiate a critical peer discussion to explore innovation in the cyber protection of ST systems. Jacques Francoeur has more than 30 years of high-tech experience and is currently the Founder and CEO of Spheric Security Solutions, a Silicon Valley-based organization focusing on developing security software to support the management and communication of security. Jacques is also the co-founder and Executive Director of SecurityGenomeProject.org, a not-for-profit community-based initiative developing a Security Control Syntax Language and Security ontology for the common good of the industry. 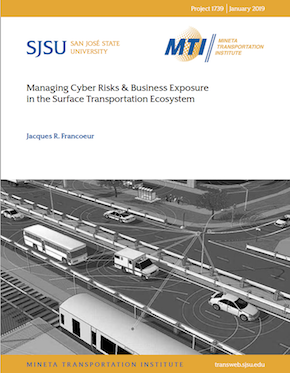 Additionally, Jacques is the Cyber Executive-in-Residence at the Lucas College & Graduate School of Business at San Jose State University and is a member of the Dean’s Global Leadership Council, and as the Senior Cybersecurity Scientist at the National Transportation Security Center, Mineta Transportation Institute, he focuses on surface transportation protection from cyber threats. Previously, Jacques was a member of Ernst & Young’s Information Security Advisory team, Security Center-of-Excellence. Prior to E&Y, Jacques was Sr. Director at the Science Application International Corporation (SAIC), where he provided thought leadership in the field of identity and information assurance. Jacques was the co-founder and former Executive Director of the Bay Area CISO Council, which is a Silicon Valley member-based nonprofit organization of Chief Information Security Officers. Jacques holds a Bachelor of Applied Science (B.A.Sc.) in Aerospace Engineering from the University of Toronto, and a Master’s of Applied Science (M.A.Sc.) degree in Aerospace Engineering from the Institute for Aerospace Studies. He earned his M.B.A. from Concordia University.